Tim has two poster projects to watch out for. The first – And For The Rest – in Athens, as part of the Fast Forward Festival 3, presents a series of fragmentary statements drawn from interviews with people excluded from the voting process in the city. A wide range of children and young people, as well as asylum seekers and refugees from Syria, Afghanistan and Iraq and elsewhere imagine changes, realistic and fantastical to the city, Europe and the wider world. And For The Rest (Athens) runs 16 – 29 May 2016. 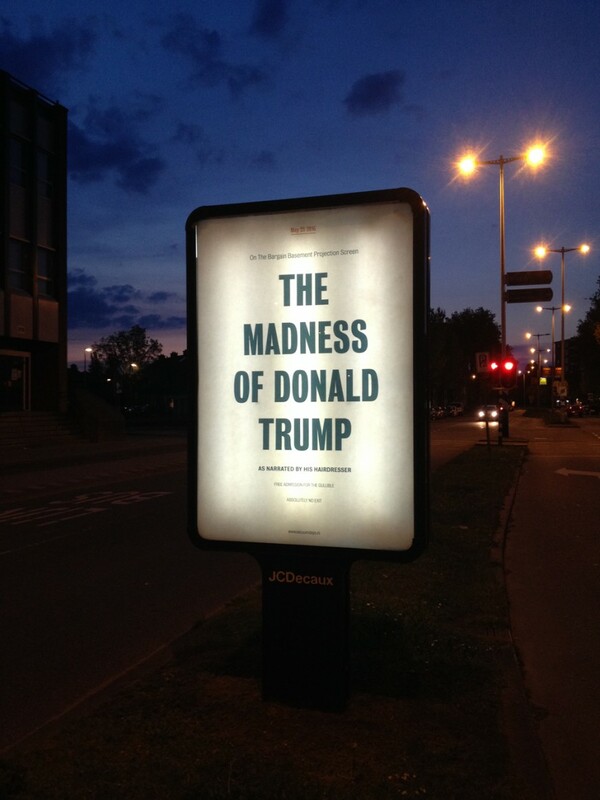 The second – Vacuum Days (Utrecht) – features a new series of ten posters in Tim’s Vacuum Days strand, drawing on current affairs, news events and celebrity figures to create a series of entirely imaginary (often absurd and hyperbolic) performances and events. Vacuum Days (Utrecht) is on display at tram stops all around Utrecht as part of the SPRING Festival, 19 – 28 May 2016. Tim will also be participating in Process, Performance, Presence at Kunstverein Braunschweig, 11 June – 21 August 2016. 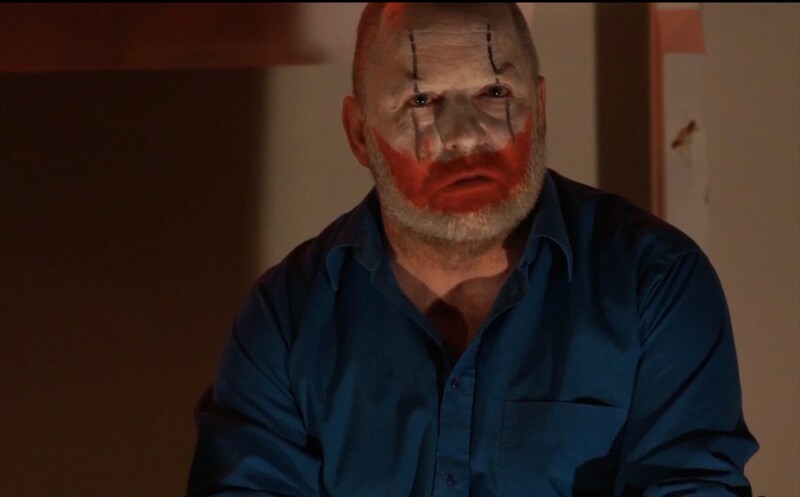 This short film, featuring Tim Etchells, Lois Keidan (Live Art Development Agency, London), John McGrath (Manchester International Festival) and Rufus Norris (National Theatre) was produced by Hugo Glendinning for the International Ibsen Award Press Conference 2016 to introduce Tim and the company. There’s more information about Forced Entertainment receiving the 2016 Ibsen Award here. Below is the text of my speech at the Ibsen Awards Press Conference, 18 March, at the National Theatre in Oslo. First of all I would like to say – on behalf of all my colleagues at Forced Entertainment – Richard Lowdon, Robin Arthur, Cathy Naden, Terry O Connor and Claire Marshall in the creative team, Eileen Evans (Executive Director), Natalie Simpson (Office Manager) and Jim Harrison (Production Manager) as well as our Board of Directors – Deborah Chadbourn, Annie Lloyd, Simon Shibli, Frances Babbage, Martin Harvey and Adrian Friedli – thank you for this amazing International Ibsen Award. We are really thrilled and touched that our work is being celebrated in this way. The core group of the company began its work together in Sheffield 32 years ago and in the time since then we have made more projects than I can remember, collaborating to investigate what theatre can be, how it can open up a space of encounter and dialogue with audiences and how it can speak dynamically into the society and the times in which we are living. Of course our collaboration has only been possible and meaningful in the context of the other extraordinary partnerships that we have built up over the years; with audiences that have come along with us on this long journey, with our funders, and with so many brilliant organisations, festivals, venues and individuals, nationally and internationally. We would like to thank them all. We’d also like to thank the extended group of collaborators that we have been lucky enough to work with through the years, a group that has helped to develop, extend and reinvent the work in so many ways. The range and depth of the company’s work has only been possible thanks to them. We’re honoured that this award comes to us and that it marks the influence and contribution of our work together in changing the landscape of contemporary theatre practice. It’s great to be recognized and celebrated in this way. But of course we also see this award as being about more than the company. Giving an award of this kind to a collective, to a group is perhaps not easy or obvious – the way the culture generally places a premium on the idea of the individual, especially in the arts – the writer, the director, the auteur – is very clear. A group, by comparison, can seem rather nebulous, hard to define. I was speaking last week at a conference in Antwerp about creative processes in theatre. In a room full of academics thinking about scripts, notebooks and other tangible materials of the creative process that they might study, I was trying to impress on them the importance of the intangible, particularly the social negotiated process of interaction between members of a group who work as we do, through a combination of improvisation, discussion, writing, and rehearsal. I want to write about making performance as a process in which no single object or material, no single impulse, no single human intention (writerly or directorial), no single frame of understanding, no single thematic, no single conceptual frame, no single inspiration, no single vision, no single factor of any kind, either rules, determines, holds sway or serves as primary guidance. I want to write about the creation and rehearsal process, as one in which – for a good while at least – many diverse elements and impulses circulate all the time, in a constant push and pull with each other; a group process of dialogue, contradiction, displacement, contraction and expansion. I want to write about the rehearsal process, the creation process, as one in which the event or object of the performance itself will appear only through this dynamic interaction of materials, frames, desires, intentions, accidents and without recourse or reference to a singular (single) guiding object, conception or vision. A space in which (at least, from the outset) there is no fixed line, no fixed center. It’s this space which the award to us celebrates – the space of many rehearsal rooms in which performance and theatre makers away from the literary mainstream in different parts of the world, have been working for decades, playing a huge role in reinventing and remaking theatre, stretching it in new directions. For us it’s the space which includes theatre but which also touches contemporary dance, performance art, multi-media experiment and installation performance, a space where artists have been working over and across the borders of art forms to challenge and reinvent what is possible on the stage, making a new language. It’s the conversations at the unruly edges of the disciplines that this award to us marks, a zone of experiment that we have long seen as a home and which we are delighted to see celebrated here. This award, we like to think, also marks and celebrates another zone, another periphery. Years ago we moved from Exeter in the South West of England, where we had studied, eschewing the shelter that the academic institution and the drama department might have afforded us, and at the same time avoiding the move to the capitol, to London, which so many of our friends were undertaking having completed their courses. We did not go to London, where the power and money in the UK were, and are, still focused. Instead we moved North, to Sheffield, to a former industrial city, at that point in decline, in the grip of Margaret Thatcher’s grotesque politics. It was an extraordinary move, hard to understand in retrospect perhaps, but it came from an understanding that innovation and change do not need to come from any idea of a centre, that the periphery has its strength, and that there might be a freedom, there, in that neglected space in which experiment could thrive. We were right about that. And so we like to think that this award, as well as celebrating the work the company has done and will do, also celebrates the creative strengths of the margins – places, approaches, voices and persons at the edge of the mainstream, at the periphery of official culture. We were a theatre company drawing on influence from cinema and performance art. Our first performance was in an art gallery, a collaboration with musician John Avery, who was part of Sheffield’s industrial music scene. We were looking for a new theatrical language with which to unpick the contemporary reality we inhabited – something that could make vivid and challenging experiences for audiences. The space we lived and worked in was in some ways a periphery, and in some ways a self-made centre all of its own. Finally we would like to see this award as something that marks and celebrates the possibility theatre has to challenge audiences. In these times of ideologically directed austerity, in these times where in the UK at least, the value of the arts in the frame of education are openly attacked and questioned by government, in these times of increased division between rich and poor (inside nations, and between nations), in these times of rising nationalism, xenophobia and racism, in these times of a political shift to the right in Europe and elsewhere, there is a pressure on the arts to prove their worth economically, and as an instrument with which to bring people together, to heal rifts that the free market and politics have caused but will not stoop to address – celebration, participation and creativity are the buzzwords we are encouraged to have on our lips. But whilst we love to celebrate and to make the work we make, and whilst we love the idea and practice of participation we know that for us the value of art, and of theatre, lies as much in its ability to challenge, provoke and question as it does in any palliative fantasy. Our work – with its comedy, its human scale intimacy and its lo-fi DIY seductiveness – has also always pursued all kinds of unease, all kinds of disquiet, all kinds of questioning, serving what we understand as a hunger from audiences for experiences that are rich but not easy. It’s this understanding – of theatre as a space of challenge – that we are happy to underline on receiving this award. And we want to say thank you again, for your recognition of what we have been doing and for the chance this award opens for us to do more and more ambitiously in the future. We’re looking forward to many more years of creative disquiet and we hope that the Ibsen Award championing our work in the way that it has will inspire others, in Europe and elsewhere to follow their own noses, their own intuitions and their own passions, to reinvent theatre in new ways that we can’t even begin to imagine. Tim Etchells, for Forced Entertainment, Oslo. 18 March 2016. This prestigious prize honours extraordinary contributions to art and culture and is awarded to an individual or organisation that has brought new artistic dimensions to the world of theatre. It is given every two years by the Norwegian government on Henrik Ibsen’s birthday. As the first ever group to win the prize, Forced Entertainment are honoured to join a distinguished list of previous winners including Peter Handke, Heiner Goebbels, Ariane Mnouchkine, Jon Fosse and Peter Brook. 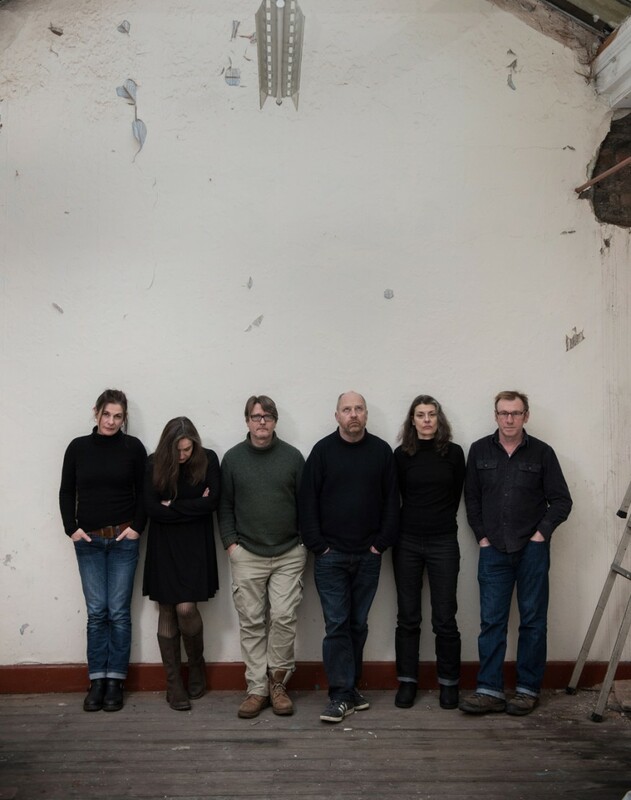 The award ceremony will take place during the International Ibsen Festival in September, at the National Theatre in Oslo, where Forced Entertainment will showcase a range of its work, alongside a symposium and a masterclass with Tim Etchells. Per Boye Hansen – Committee Chair. Artistic Director of the Norwegian National Opera and Ballet. Former Head of the Bergen International Festival (Festspillene) and Director of the Komische Opera, Berlin. Julie Holledge – Professor at Flinders University, Australia. Chief Investigator for AusStage project. Roman Dolzhanskiy – Theatre critic and dramaturge. Chief Dramaturg at the Theatre of Nations (Moscow). Artistic Director of the NET (New European Theatre) Festival. Dr. Thomas Oberender – Director of the Berlin Festival. Former Director of Drama for the Salzbürg Festival. Hanne Tømta – Artistic Director of the National Theatre in Oslo. Stephane Braunschweig – Theatre Director and Artistic Director of Théâtre National de Colline, Paris. Sofia Jupither – Swedish theatre director. Producer and Director of Jupither Josephsson Theatre Company. 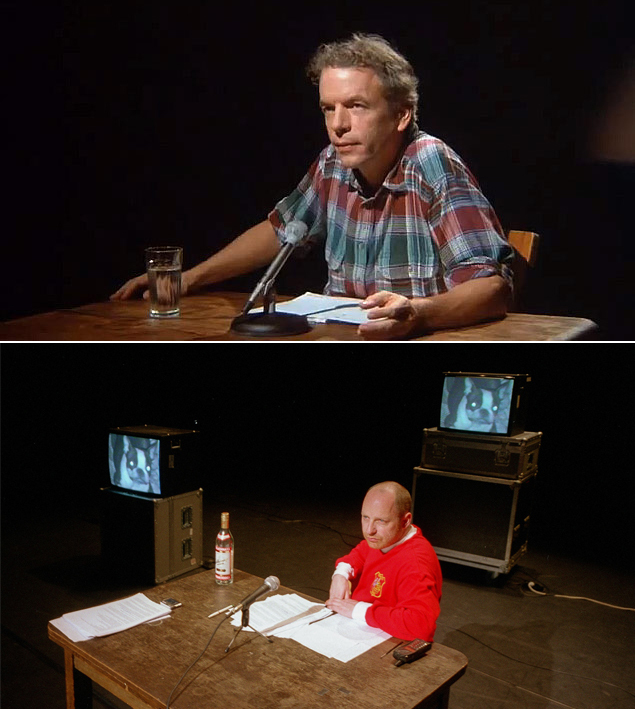 You can read the full text of Tim’s speech at the Press Conference in Olso, announcing the award and watch the video made for the same event, introducing Forced Entertainment – featuring Tim Etchells, Lois Keidan (Live Art Development Agency), Rufus Norris (National Theatre) and John McGrath (Manchester International Festival). You can see Tim’s improvised solo performance A Broadcast / Looping Pieces at De Singel in Antwerp, Weds 9th March, 2016 at 8pm. The next day, linked to the presentation of the performance, he’s keynote speaker at the international conference on creative processes in the performing arts; Tracing Creation (Genetics/Genes/Genealogies of Performance). Tim features in the latest installment of the brilliant ongoing 52 Portraits project. Created by choreographer Jonathan Burrows, composer Matteo Fargion and video maker Hugo Glendinning, the work comprises a short gestural portrait of a dancer or performer, released every Monday throughout 2016. You can watch already released portraits on the website, and sign up to receive a portrait direct to your inbox each week. 52 Portraits is supported and produced by Sadler’s Wells. Image: Spalding Gray in 'Swimming to Cambodia', Tim Etchells in 'Instructions for Forgetting'. Text below of my acceptance speech for the 2016 Spalding Gray Award. What must be a long time ago, in England, when my colleagues in Forced Entertainment and I were first starting out to make performances we believed with a passion that the world we lived in, the new world that was coming into being around us, needed a new language, ‘a new grammar to unpick it’, as my friend the writer Claire MacDonald wrote at the time. I still think that’s true – because making theatre or performance is always at its best an act of re-making – re-purposing and re-inventing forms in order to better meet and speak into the times we are living in. Part of how we kept ourselves thinking about that new language theatre needed was by engaging with the city we found ourselves in – the formerly industrial city of Sheffield, in the north of England – taking inspiration from people we met, from all kinds of ideas, things and feelings we encountered there, directly and indirectly. Another way we kept ourselves focused on that idea of a new theatrical language at that time was to see the few experimental performances that came to Sheffield or nearby cities like Nottingham and Manchester. Seeing other work was both food and inspiration – it was also sometimes a kind of negative inspiration. We raged and ranted about things we hadn’t liked, all part of defining who we were and what we found important. For the rest, this all being pre-internet, we relied not on youTube but on rumours and on the small number of books or magazines that covered performance to tell us what other people were up to in other parts of the country, and in other parts of the world. 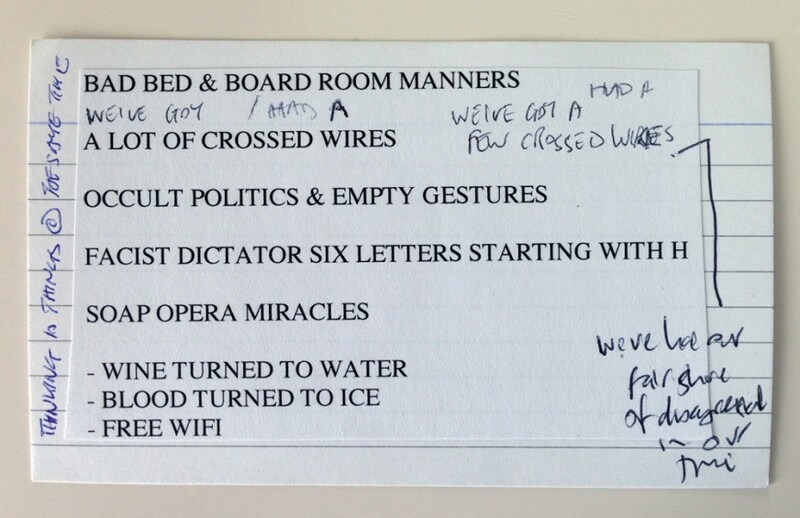 Information of this kind reached us by slow circuitous and erratic routes; we read reviews of performances that we had not seen, saw images of productions in other countries which we could only vaguely imagine, and occasionally, a VHS tape passed to us from someone or other – an actual performance. It was in that kind of way that I first heard of Spalding Gray’s work, solo, and with the Wooster Group. 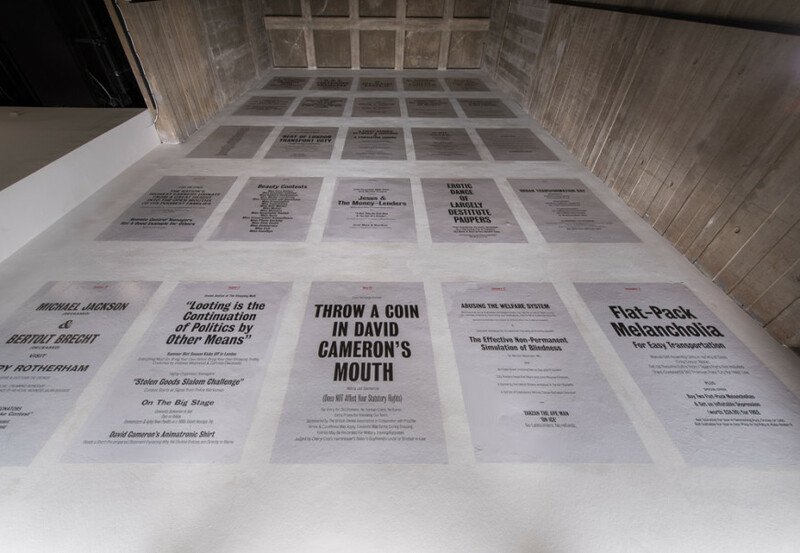 I remember reading, in TDR I think, about Three Places in Rhode Island, the Wooster Group pieces based around Spalding’s life experience and texts, and I remember seeing images of those performances, puzzling over the black and white traces and descriptions of the making process. Later I’d read his first set of monologue texts published together in UK as Swimming to Cambodia and later still see the Jonathan Demme film of that performance as well as other performances and texts by Spalding. Of the artists and performers whose faces I got to know from grainy TV documentaries watched on VHS video back in the mid 1980s I’ve been lucky enough to meet a few in the ensuing years and to consider some of them friends, as my work has brought me into the same rooms, festivals and other contexts in different parts of the world. Spalding Gray I never met and for one reason or another I never got to see him perform live. I’m sad about that. I would have liked to talk. Spalding has stayed with me though as someone who both inspired and help clarify my own practice, a person that pursued his own approach to performance and in doing so opened doors towards that new language theatre needed in order to meet the times. It means a lot to me to receive this award. I’m thrilled by it and thrilled to be able to put the money that comes with it towards supporting the new Forced Entertainment production Real Magic. Forced Entertainment has been lucky in recent years to have core support from the Arts Council in the UK but the production of projects is something that requires us to find international partners who can support the realisation of the work. The work of building up the ensemble, and developing the shared practice, collective understanding and skills the group has is something that’s only ever been possible through the support of partner organisations and venues in different parts of the world. Forced Entertainment’s work can be deceptive. The home-made, lo-fi aesthetic, the second hand costumes and shanty town sets, people reading from long texts or sitting at tables doing Shakespeare with domestic objects, the subtle lighting changes that aren’t always noticed but which always make their difference to the work, the scratchy brutal collage form of some of the pieces and the minimalism we’ve pursued which somehow avoids the chic that minimalism can have – all of these can quite easily look offhand, disguising the precision, skill and consequent approach we have to the work. Where in a lot of contemporary European and North American work at a certain scale you literally get to see the money on the stage – in flashy design, tech costume and other things, in Forced Entertainment’s work you often see the opposite. The stage looks bare, broken down even disreputable, whilst such financial resources we do have are invested in time – on studio time and working together, on making performance in the most dynamic and direct ways we can. Making a new theatre, to speak in new ways about the times we are living in, takes an extended time in the rehearsal room, developing the kinds of skills and approaches that are useful, trying things, improvising, arguing; time doing the kind of hands on studio work that really drives what we are doing along. 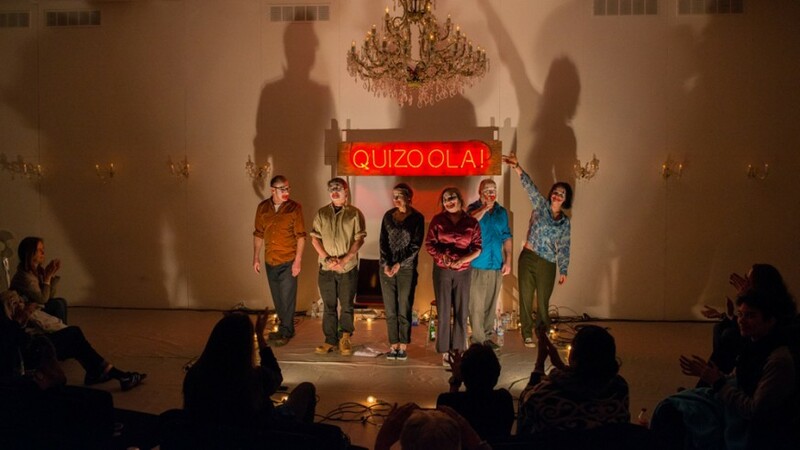 It takes time, and the support of the Spalding Gray Award – looked after by Kathleen Russo, Spalding’s widow; Performance Space 122 in New York; the Walker Art Center in Minneapolis; the Andy Warhol Museum in Pittsburgh; and On the Boards in Seattle – will help us greatly with that, joining support from the Arts Council of England, as well as the European partner venues and festivals that are also contributing to the new production. Thanks to everyone involved in the Award. It’s hugely appreciated. Coming to a close now, but there are two things I want to add. The first is to say that I’m well aware of the company I’m keeping in receiving this award. The connection to Spalding’s legacy is perhaps one of the things that has tuned me to other work coming out of the US – and it’s really an honour to be in a list that already includes such great makers and innovators as the previous recipients of this award – people like Young Jean Lee and Richard Maxwell are friends and very much fellow travellers in the contemporary performance scene whilst Radio Hole are legends that I have yet to catch up with. The only non-American I see on the list is Rabbih Mroue, who, again, as well as being a friend is someone whose work has challenged and inspired me on many occasions. I’m proud to be in such company. The other thing I want to turn to now is our present context – to this season of my work, and especially my work with Forced Entertainment that has been brought here to the MCA in Chicago by Peter Taub and his team, with the support of the British Council, especially Salette Gressett whose enthusiasm has been really instrumental in making this all happen. I want to thank Salette and Peter, not just for the mini-festival of works that is being presented as of this evening with the first performance of The Notebook, which I made with Forced Entertainment, but also for hosting this reception. I also want to thank Deputy Consul General Martin Whalley for his opening remarks and for joining us in bringing this event together. A presentation of four different works over a nine day period as we have here at the MCA in Chicago right now certainly takes some organising, resources and hard work, but I think it does something very valuable – allowing audiences to see the different facets of my work with Forced Entertainment and others, it also allows for a deeper contact and dialogue, which I am very happy and excited about. It’s a joy to me that the long running dialogue myself and colleagues have had with Matthew Goulish of the Chicago based performance group Every House Has A Door will find further expression in the Institute of Failure event next week and that my Forced Entertainment colleagues will be able to meet, in discussions, workshops and talks, other people from the performance scene here in Chicago. Michael Thomas from the Chicago group Lucky Pierre and I have planned to meet on at least two different occasions – once in New York I think, and once this week in Chicago – seems like it’s not meant to happen yet. But one day it will come! Finally, thanks again for this award, amazing to me in so many ways. I hope we can make good use of it, and look forward to presenting the new work in the US. The on-going dialogue is important to us, keeping us strong, forward facing, experimenting. We will use the support in our work back in Sheffield, where in rehearsals we are still trying to make a new theatre, a new new theatre, which we need to speak into the troubled and violent times we are living through. We need that, now, as much as ever. 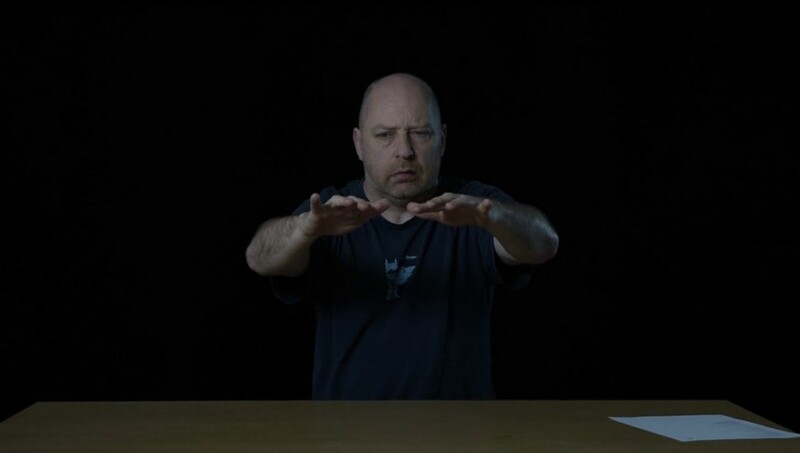 Tim Etchells has been awarded the 2016 Spalding Gray Award. Named after the groundbreaking monologist Spalding Gray (1941–2004), the award is sponsored by a consortium that includes Kathleen Russo, Gray’s widow; Performance Space 122; the Walker Art Center in Minneapolis; the Andy Warhol Museum in Pittsburgh; and On the Boards in Seattle. The Award comes with a commission to create a new work and provides for a full production of that work presented by each organization. Past recipients include Richard Maxwell, Rabih Mroué, National Theater of the United States of America, Radiohole, and Heather Woodbury. The Spalding Gray Award was announced 18th February at the Museum of Contemporary Art in Chicago at an opening reception for Forced Entertainment’s current retrospective there, co-hosted by The British Council and the MCA Chicago. The retrospective includes presentations of The Notebook, and Speak Bitterness, excerpts from Complete Works: Tabletop Shakespeare and an event as part of Etchells’ ongoing collaboration with Matthew Goulish, The Institute of Failure. With the Spalding Gray Award, Etchells will collaborate with Forced Entertainment to create a new performance piece titled Real Magic which premieres in Germany this May, and will tour to venues in the US during 2016 and 2017. Group show – The Alternative Document, at Project Space Plus, University of Lincoln. 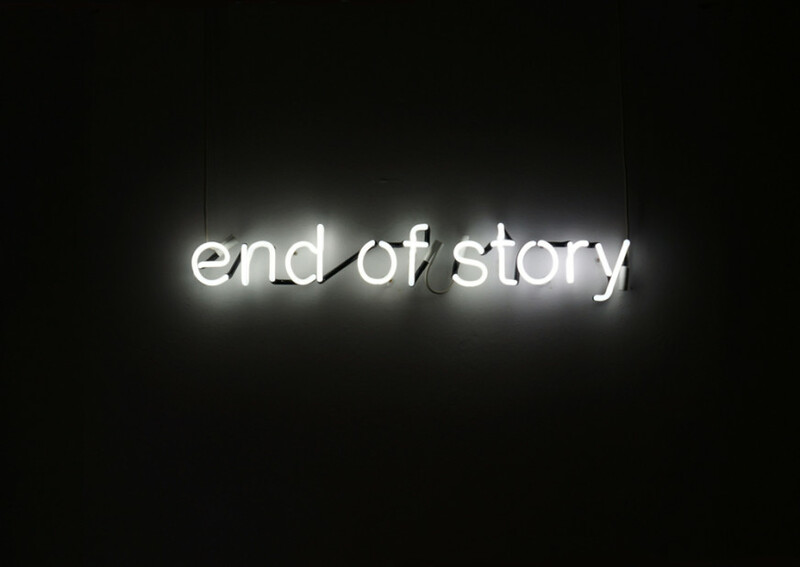 Curated by Angela Bartram & Mary O’Neill, and including work by Tim Etchells, The Alternative Document seeks to expand on the idea of the ephemeral and its loss, by offering a platform where alternative acts of legacy can be encountered, viewed and discussed. 13th February – 11th March, 2016. SPRING festival in Utrecht is inviting young artists within the field of performing arts to apply for a Tim Etchells workshop and masterclass, Re-Make Re-Purpose, to be held 20 & 21 May 2016. This two-day workshop draws on Etchells diverse practice, spanning work with text in performance, visual art and fiction. It takes place alongside a new presentation of Etchells’ Vacuum Days Posters, created especially for SPRING Festival and the city of Utrecht, . Application information can be found here. Closing date is March 18 2016.